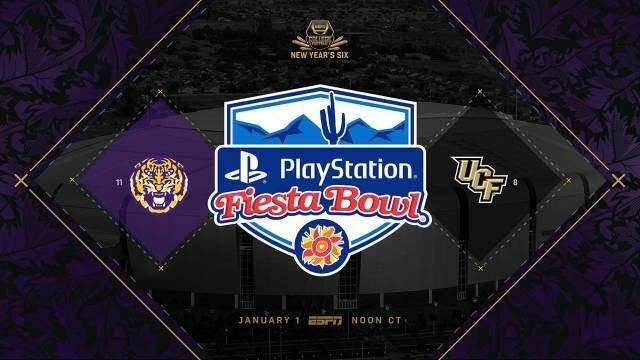 The Fiesta Bowl always features two of the best teams in the country and this year is no different with the LSU Tigers and UCF Knights set to face off on New Year’s Day. Assuming both teams live up to their reputations, it could end up being one of the more exciting games of the day. Why? Because there will be a lot more than just the Fiesta Bowl trophy on the line. Well—not so much when it comes to LSU. But there is certainly quite a bit on the line for UCF. A win means the undefeated streak continues (currently at 25 games). Defeating another SEC team in a bowl game (they beat Auburn last year in the Peach Bowl) will give them more of a reason to demand respect. When naysayers talk about their schedule, the Knights can point to their last two bowl games (if they win). This year’s UCF team does not have quite the same star power as last year’s group did. But they had enough in quarterback McKenzie Milton to get the team most of the way. Milton was having another fantastic season before breaking his leg in the final regular season game. But Darriel Mack Jr. has been able to step in and keep the good times rolling. The only experience he has is what he has received the last two games. Overall, he has done well. It certainly helps that the Knights offense isn’t dependent on the passing game. They have a good one (29th; 268.9 yards/game). But they get a little bit more out of their fifth-ranked rushing game (276.5 yards/game). Most of that was with Milton at the helm, of course. Can Mack maintain the status quo? He did in his one start (19-27 for 348 yards and two touchdowns; the team had 350 yards rushing). However, like many high-scoring offenses (fifth; 44.2 points/game), they have some issues on defense. They tend to give up quite a few yards (No. 83 in total yards allowed). They are especially vulnerable against the run (No. 117; 227.4 yards/game allowed). But while they give up a lot of yards, they don’t give up a lot of points (No. 25; 21.3 points/game). The Knights defense could either be in luck because LSU does not have a strong offense (No. 81 in total yards), or they could make the Tigers look like a bunch of All-Americans. LSU does have a good run game (No. 58; 174.7 yards/game) but they are not good at throwing the ball (No. 80; 214.7 yards/game). So, they could potentially grind out a win over UCF. But if the Knights and their quick tempo offense get out to an early lead, the Tigers will struggle to throw their way back into the game. Many are picking LSU to win because they are a good team from a good conference that went 9-3 against a very tough schedule. They may not look like much on paper and their stats are not impressive. But they tend to find a way to do what matters most—win. But the Knights are undefeated for a reason. Yes, their schedule is not incredibly tough. But that doesn’t mean they can’t keep up with the bigger schools. They just need more opportunities to prove they can. LSU’s defense is good enough to slow down the UCF offensive juggernaut but not good enough to stop it. LSU is favored by seven, but don’t be shocked if UCF wins by seven. Take the Knights to win, straight up. If they don’t win, they will cover the spread. As for the over/under (57)—LSU’s defense will not let the Knights offense go wild. But LSU’s offense will not go wild either, so take the under.